Contemporary looks and styling, modern technology and sounds to match? Great ideas in one package - and a great bass in its own right. A well thought-out solution to MIDI triggering. A little complicated for some players. 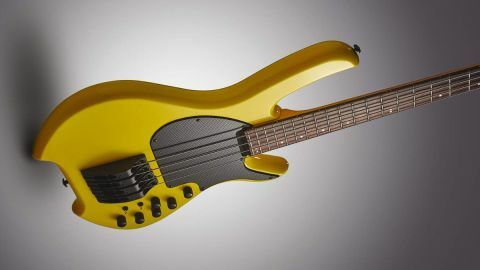 We applaud innovation here , and we loved the last Lightwave Saber bass - an SL5 fretless - when we reviewed it back in September 2011. Still, technology moves along at a rapid rate, and eight years later who knows what extra digital witchcraft lies under the bonnet of this new Saber, the HexFX? At £1350, the instrument is within the grasp of many players - so let’s see how this latest incarnation performs. The HexFX’s angular, futuristically shaped body is built from solid alder. It lacks contouring to the front or rear of the body, but on the upside its Highlight Yellow colouring and gloss polyurethane finish set it off a treat. A graphite scratchplate adds to the modern vibe, while deep cutaways offer unhindered access to all 24 frets. The level of finishing is professional, with a fine string action and no sharp fret ends anywhere on the neck. With monorail Icetone-equipped bridge saddles for each string forming the Graphtech Monolithic bridge system, the instrument’s sleek appearance isn’t compromised. A mono jack output socket is situated along the edge of the lower body bout, along with a 13-pin DIN connector which allows full MIDI and synth access to make full use of the bass’s capabilities. The control setup may look a little daunting (just look at that spec!) but if you don’t make use of the MIDI capabilities, one switch and one control become redundant anyway. Flipping the bass over reveals a large backplate which hides the processing circuitry, while an additional socket on the body edge allows the bass to charge up, courtesy of a charge pack, so that the optical pickups, piezo and active circuit all function. Now for the clever part. Instead of traditional magnetic pickups, the HexFX has an optical pickup system, which uses infrared sensors housed in the bridge to ‘see’ the string vibrating without affecting its motion or performance. This provides a transparent signal, implying that a pure, accurate and natural bass sound will be the result. The bass has a good resonant response before being amplified, so plugging in, what do we have? The tone is quite something - clear and precise, resonating strongly and with substantial sustain. Accurate fretting and damping are important, as every nuance of the strings’ movement is conveyed, meaning even string noise and mistakes are amplified. String volume is even across all four strings and string resonance is projected accurately. Getting to grips with the EQ is relatively simple; the bass EQ fattens up the naturally bright tone, which is particularly useful in a band context, while the brighter tones work well for soloing. The mid- EQ is very noticeable when boosted or cut, and sweeping across the mid- frequencies shows considerable variation. You may wonder why there is no treble control. This is where the Icetone blend comes into play; inside each bridge unit is an additional piezo pickup, which provides clear, detailed top end. This unit highlights increased articulation and detail elements, but on its own, it may not supply enough functional thunder for most players’ requirements. Essentially, you have a choice between the optical Lightwave pickups, the piezo pickups or a combination of the two. Some players will like this, some won’t. Experimentation is called for to find the tones you’re after. The bass is comfortable to wear and play; there is some minor headstock bias, but the overall balance is good. The three-piece maple neck, finished in satin polyurethane, boasts a sleek, slippery feel and alongside the standard 19mm string spacing, 40mm nut width and slim C-shaped neck profile, the neck as a whole feels very familiar. A chunky brute this is not. As a fretless, we can see many advantages to this high-functioning bass. We’re less convinced by it fretted, but we can’t deny its clear tonal performance - and once you get used to having nowhere to place your thumb, it’s a real joy to play.